Amid all the sound and fury of the United Nations (UN) and other international efforts to tackle new conflicts erupting on the continent – especially the sectarian slaughter in the Central African Republic (CAR) – the ‘graduation’ of Sierra Leone from intensive UN peacekeeping care on Monday passed barely noticed. 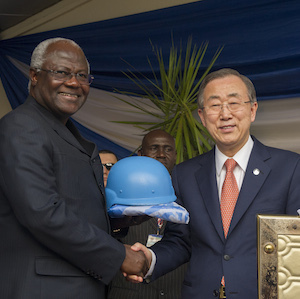 On 5 March, UN Secretary-General Ban Ki-moon went to Freetown to close the offices of the decade-old UN Integrated Peacebuilding Mission in Sierra Leone (UNIPSIL), and to mark its ‘successful conclusion,’ which he called a ‘triumph for the people of Sierra Leone.’ UNIPSIL formally ended on 31 March. Ban listed the many UN ‘firsts’ in Sierra Leone, including the UN’s first ‘multi-dimensional peacekeeping operation with political, security, humanitarian and national recovery mandates;’ the first UN Deputy Special Representative who also served as head of the UN Development Programme (UNDP), UN Resident Coordinator and Humanitarian Coordinator; and the first visit of the UN Peacebuilding Commission. ‘Our blue helmets disarmed more than 75 000 ex-fighters, including hundreds of child soldiers. The UN destroyed more than 42 000 weapons and 1,2 million rounds of ammunition – a potentially deadly arsenal that is now itself dead. ‘The UN helped the government to combat illicit diamond mining that fuelled the conflict, and to establish control over the affected areas. With the UN’s help, Sierra Leone held its first-ever free and fair elections. ‘The UN assisted more than half a million Sierra Leonean refugees and internally displaced persons when they voluntarily returned home. We helped train thousands of local police.’ And so on. Ban also said the ceremony he was presiding over was ‘very symbolic,’ which indeed it was; it was a bracing tonic, an all-too-rare litany of success for UN peacekeeping operations – most of which, unfortunately, end in tragedy or simply get bogged down and never leave. The members of that club were, of course, victims, like countless others, of Foday Sankoh’s unspeakably barbaric Revolutionary United Front (RUF) rebels, who routinely chopped off the arms, legs, ears and noses of ordinary Sierra Leonese in their long reign of terror before they were finally defeated in 2000. Two weeks after Ban’s speech, the UN Security Council announced that the UN Peacebuilding Commission would also wind down its operations in Sierra Leone over the next year before pulling out. That would, hopefully, mark the final graduation of Sierra Leone from the UN’s intensive care unit, so to speak. Ban’s graduation ceremony was, of course, all the more symbolic and poignant because this was the country that had come to epitomise the utter hopelessness of the African continent 20 years ago. In February 1994, Robert Kaplan published a seminal article called ‘The coming anarchy,’ in which he predicted that the murderous mayhem then ruling Sierra Leone and Liberia would overflow their borders like a tsunami, and destabilise the entire region and beyond. He certainly seemed to be on the money when Côte d’Ivoire, until then a bastion of stability in West Africa, also soon succumbed to violent chaos. But Kaplan’s dire forecast, which became something of a set work in Western capitals, also helped spur the international community to unprecedented action. Over the next two decades, Liberia and especially Sierra Leone, received an unheard of level of attention from the responsible world as it tried, in effect, to prove Kaplan wrong. Ban’s speech in Freetown outlined some of the UN’s contribution to that recovery. What he did not mention, perhaps not surprisingly, was South African mercenary company Executive Outcomes, which played an important role in stabilising Sierra Leone by defeating the RUF for the first time way back in 1995. Nor, perhaps more surprisingly, did Ban mention either the robust contribution of the Economic Community of West African States Monitoring Group (ECOMOG), or that of the British military, which inflicted the final military defeat on the RUF in 2000. The British stopped Sankoh’s thugs in their tracks as they advanced on Freetown – in armoured vehicles they had captured from the then-hapless UN peacekeepers. So without the British especially, Ban’s 5 March graduation ceremony would not have happened. That is now perhaps detail, though not unimportant. The bigger picture is that the international community, in one form or another, has poured an enormous amount of money and effort into graduating that unpromising student, Sierra Leone. The UN peacekeeping missions alone, by some estimates, have cost in the region of US$2,5 billion. That does not take into account support for the hybrid Special Court for Sierra Leone (which convicted ex-Liberian President Charles Taylor for master-minding much of the mayhem in his neighbour’s country), the cost to the British taxpayer and many other sundry expenses in the huge international effort. All that effort has borne real fruit. Sierra Leone has held three relatively peaceful, general elections in this century and seems, so far, to be holding to the narrow path of recovery. It would, of course, be foolish to say it is completely out of the woods, as the economy really needs to get back on its feet to make the peace really sustainable; and governance is by no means perfect yet. In 2005, the veteran Africanist Stephen Ellis got himself into a lot of trouble. He proposed in an article in the prestigious US journal, Foreign Affairs, that the only remedy for Africa’s most failed states, like Sierra Leone, Liberia and Somalia – was ‘international trusteeship.’ The international community, represented by the UN, would have to co-govern those countries until they could stand on their own feet. He recognised his article would be greeted with outrage in many quarters as a proposal for a return to colonialism, as indeed it was at the time. More recently, his critics have, with the benefit of hindsight, been able to point out that he simply got it wrong – citing Sierra Leone’s successful last election in 2012 as a prime example. But when you look back at the enormous effort that the UN and the rest of the international community have put into Sierra Leone, you have to wonder whether that wasn’t the next best thing to trusteeship anyway.